SpreadBettingPortal.com > FAQs > Difference between a normal stop & a guaranteed stop loss? What is the difference between a normal stop loss and a guaranteed stop loss order? To help you manage your risk without needing to constantly monitor the markets, spread betting providers have a number of tools in place to ensure you can limit your exposure. 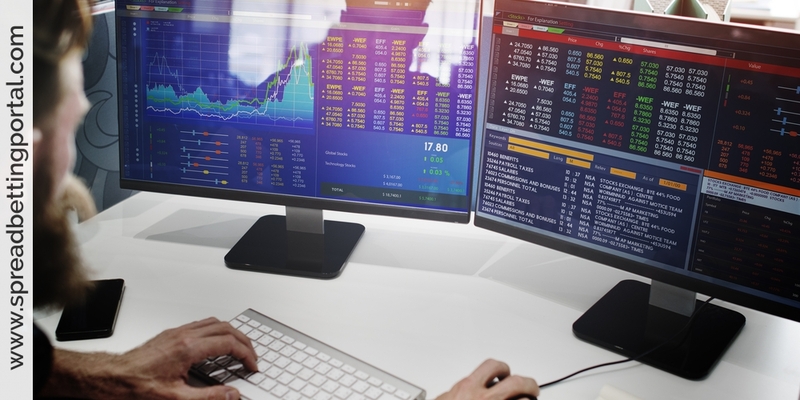 Spread betting providers offer some minimisation strategies to mitigate losses. Replicating the stock markets, you can place stop loss orders on your spreadbets, which will stop you out if your bet goes too far in the wrong direction. OK, but what is a stop loss? 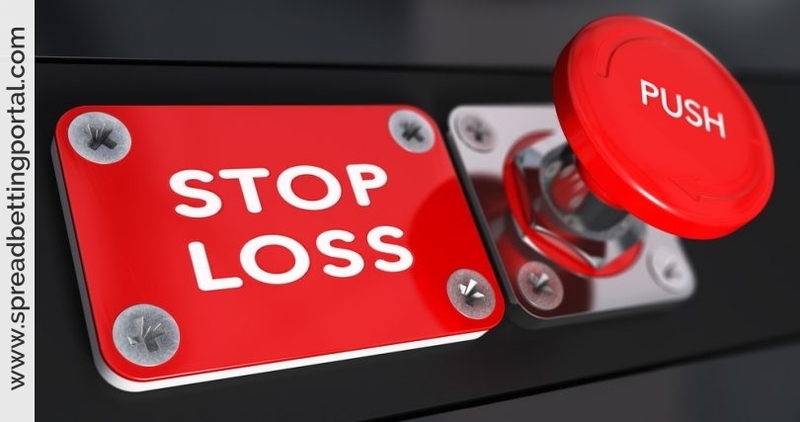 As the name suggests, stop-losses enable you to limit your potential loss on a position. A stop loss is simply a way of capping the amount you can lose on any single spreadbet. You may for instance decide that you are willing to put at risk no more than £100 on a particular trade. If you place a trade at £10 a point, you would set your stop such that it would automatically close the spreadbet at the level where you would have lost 10 points, or £100 (£10 x 10 points). 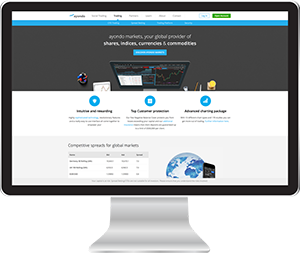 A standard (normal) stop loss order is offered free of charge from all spread betting companies. It is available on all markets and once triggered will close out your position at the best price available in the market. If the market gaps, this may mean that your trade would be closed out at a price which is different to that of your stop loss level. Imagine there is nervousness about the prospects for financial institutions in the eurozone, given their exposure to eurozone debt. You believe this has the potential to lower Barclays’ share price. To limit your risk, you decide to place a free stop-loss 10 points below your entry level, at 213p. The next day, there is news of a Spanish bailout and Barclays shares fall, along with the rest of the market. Near the end of the session, the shares pass your stop level of 213p and your stop order is activated. At 213p, the shares are 10.82 points below your entry. At £10 per point, that is a loss of £108.20. If you hadn’t had the stop in place and the shares had continued to fall, your loss could have been much greater. The stop loss has fulfilled its role and has limited your downside. 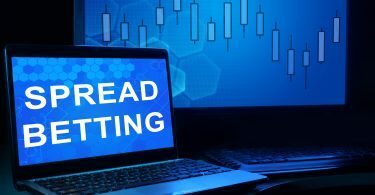 One advantage spread traders have over regular stock stop losses is that stops with spread betting can be ‘guaranteed’. If you are trading a real stock, there is always the risk that the price may whiz past your stop level without ever actually pausing at it – so you won’t be stopped at exactly the price level you want but at ‘best execution’. But a bet is simply a bet, and any stop loss conditions can be more easily priced into it. Important: Please bear in mind that stop-losses may be subject to slippage. This means if the market moves quickly we may not be able to close your position at the exact price you asked for, although we will endeavour to do so. As a result it may be possible that your stop ‘slips’ and closes at a price slightly lower than the one you chose. To avoid slippage, you can place a guaranteed stop. A guaranteed stop loss order guarantees to close out your trade at the price level specified, irrespective of whether the market gaps. To place an absolute limit on your risk, you can place a guaranteed stop. This removes the small possibility that sudden market movements may result in your stop-loss being executed at a slightly worse level than you had specified. Guaranteed stops ensure that no matter how volatile the markets, your risk will never exceed the level you have chosen. There is an extra charge for this protection, in the form of a slightly wider spread. You will see this extra spread on the deal ticket when placing the bet. So, guaranteed stop loss orders provide the best protection however keep in mind that for guaranteed stop orders there is an extra premium. 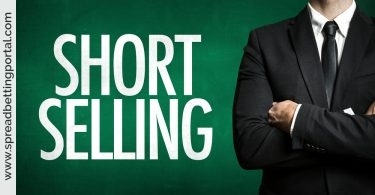 Because the spread betting firm guarantees to close your spreadbet at the stop loss order level even if the price in the market ‘gaps’ past it, there is usually an extra charge for this service, incorporated into the price quoted for the bet. Note also that not all spread betting providers offer guaranteed stop loss orders and they are not available on all markets. Looking at IG they have guaranteed stops which cost you an extra few ticks/pips in spread. ie if the market is £10.01 bid@ £10.03 and you want to buy, instead of paying £10.03 you may pay £10.05…..as an example. So for instance if you had bought £5 per point of the Dow Jones Index at 10150, and specified 9980 as your maximum stop loss exit level, you could use a guaranteed stop loss order at 9980. This way, should the Dow Jones fall sharply down to 9960, your trade would still be closed out at 9980. With a guaranteed stop loss you pay a small charge to guarantee your order will be executed at the exact level that you set, regardless of market gapping. Guaranteed stops are especially useful in certain situations when there is a risk that the market you are trading could gap up or down overnight when the underlying markets are shut. For instance guaranteed stops can be useful when dealing with individual stocks and indices as you can face a gapping risk where stocks may decline sharply overnight while the stock market is closed and when they open they fall beyond your stop loss level. Guaranteed stops can also be useful when the markets are prone to violent swings as they work by automatically closing trades at pre-determined levels so in effect ensuring that spread trades are closed at the price you want. Of course the comfort zone and peace of mind that guaranteed stops allow comes at a price, and you will pay more for the transaction. Guaranteed stops come at a price, usually amounting to about 1% of the trade. You can buy guaranteed stops with IG Index for instance the spread on eur/usd is 2 points,with a guaranteed stop this costs 5 point spread. Also, spread betting providers are quite savvy with their own risk controls and won’t provide guaranteed stops for stocks with low capitalisation. In most cases I don’t bother to take guaranteed stops – its not really necessary unless you trying to trade news or particularly volatile markets like commodities. The other thing to keep in mind that stops crystallise losses so if the markets recover after your position has been closed, you would miss out on any gains. Having said traders have been increasingly make use of guaranteed stop loss orders given the extremely volatile market conditions. Note: One of the key advantages of spread betting is the ability take on both small and large positions. Taking out smaller positions is another way of managing your risk. 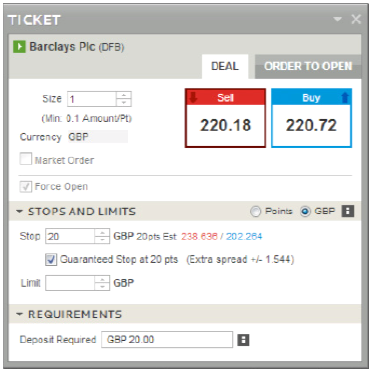 In the example above, we bought Barclays at £10 per point, and incurred a loss of £108.20. If you had felt less certain about Barclays’ prospects in the coming days, a sensible way to manage your risk would have been to enter the deal with a smaller position size. You could have chosen to take the Barclays position at at only £4 per point. In the same scenario your loss would have then been £43.28, much smaller than with a £10 per point position. If the market hadn’t gone against you (ie Barclays had not fallen sharply the next day), then you could have subsequently added to your position by placing another bet, and so on, until you reached the same exposure as in the original example. PS: If you are using a spread betting firm which is what most will be doing these days, you can (and should) always use a guaranteed stop when trading volatility. It costs a bigger spread in the first place but you can then move it around at your heart’s content. I recently had a large position in solo oil long not short, took the guaranteed stop and then trailed it to the price as it moved up, when the duster was announced the stop kicked in and saved me a fortune. PPS: You might find that IG won’t open a position for £1000pp on a limited risk (guaranteed stop) basis. You might have to open smaller positions and be required to set different stops for each one. That’s been my experience with limited risk anyway.